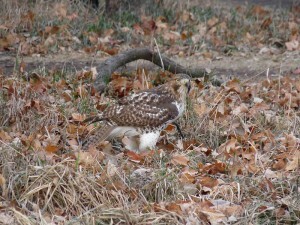 I spent about an hour at Montrose this morning, December 7. The birds and birding feel mostly like winter, which means I didn’t have a lot of variety, but the morning wasn’t a total loss. I didn’t see the Snowy Owl, and it wasn’t seen yesterday, so perhaps it has moved on. I suspect there will be a few more this winter, judging from the numbers to the north of us. 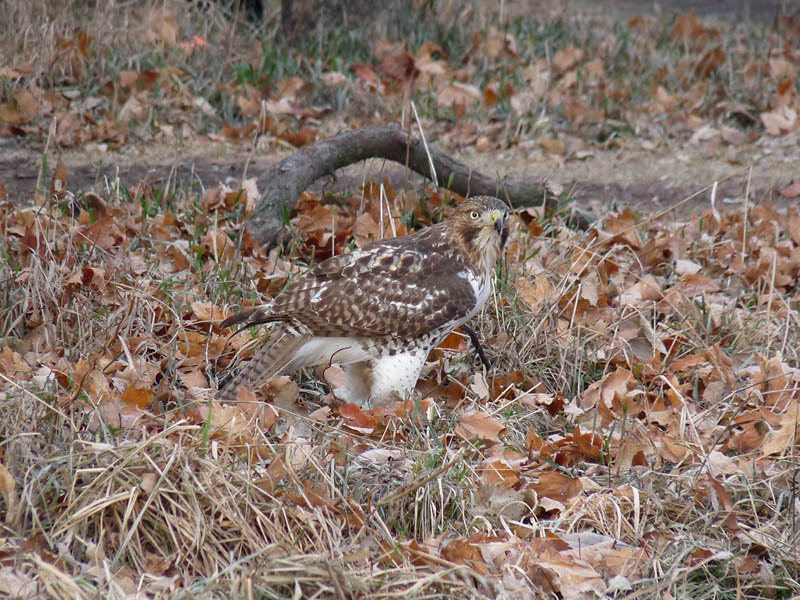 The large raptor highlight was the continuing juvenile Red-tailed Hawk, which was dining on a rabbit near the Magic Hedge. This bird has been around for about a month and has no doubt made significant progress in reducing the rabbit population at Montrose. I also saw a young Great Black-backed Gull flying around the fishing pier, a male Red-bellied Woodpecker, and a heard only Snow Bunting. There were birds inside the harbor too, including a lone lingering Horned Grebe, a handful of Greater and Lesser Scaup, and what looks like a young male Ring-necked Duck. This entry was posted in Winter Bird Reports and tagged Great Black-backed Gull, Gulls, Longspurs, Snow Bunting on December 7, 2014 by rhughes. I walked around Montrose for a little while this morning, December 3. My best find was the continuing female Long-tailed Duck in Lake Michigan near the tower at the southeast corner of the point. I haven’t seen her in a couple of days but I assume this is the same bird. Other birds seen at Montrose this a.m. include 3 Ruddy Ducks in the lake outside of the harbor, 2 Horned Grebes inside the harbor, and a flyover Pine Siskin. This entry was posted in Winter Bird Reports and tagged Finches, Grebes, Horned Grebe, Long-tailed Duck, Pine Siskin, Ruddy Duck, Waterfowl on December 3, 2014 by rhughes.